This weeks 'I saw the sign!' is related to safety in the home. Specifically to do with looking after our little ones. 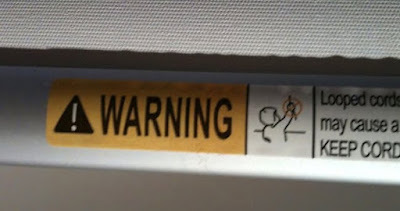 This warning label can be found at the bottom of most modern chain or cord type of window blinds and coverings. 359 children were strangled by window covering cords from 1981 to 1995. That's 1 per fortnight. - Infants playing or sleeping in their beds near windows got caught and tangled in looped cords of the window covering. - Toddlers, while trying to look out a window or climbing on furniture, lost their footing and were wrapped in the cord. Have a walk around your home today to make sure there is no strangulation hazard around your windows.